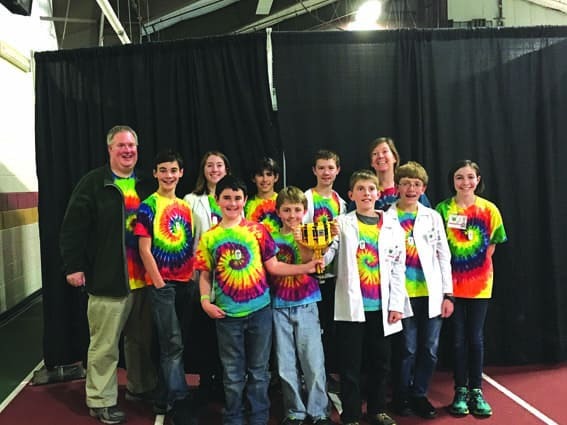 RUTLAND—A Rutland area robotics team will be headed to St. Louis, Mo., in April to compete in the FIRST® World Championships. FIRST sponsors robotics and technical competitions for students at all levels. The Robo-Rattlers compete at the FLL level, where students aged 9 through 12 design, build and program a LEGO robot to complete missions autonomously on a 4-foot by 8-foot game field. Each year, the program has a new theme. This year’s theme is Animal Allies. Robot tasks this year include: gathering and moving food to feed animals, transporting a shark tank, operating a milking machine, and hanging the robot on a wall. Teams also investigate and create a solution for a real-world problem related to the theme. The Robo-Rattlers tackled the problem of pets left in hot cars and designed and manufactured a cooling system that closes into a car’s window and runs off the car battery. The system texts regular temperature updates to owners and even sends warnings if the temperature is rising too high. The Robo-Rattlers have competed at the FLL level for four years. Currently, there are nine kids on the team from all over the Rutland area. Through this program, they have learned computer programming, engineering design and construction, electronics, public speaking and presentation skills, leadership and teamwork, and other essential life skills. “The kids have worked really hard and it’s great so see them grow so much over the years that they have participated. Public speaking, project planning, working with a group, what FLL calls ‘core values,’ are such great skills for all these kids moving forward no matter where their educational and work paths take them. These are the ‘soft skills’ that every employer and college looks for,” said Randal Smathers, a parent of two children on the team. Currently, the Robo-Rattlers are working hard to get ready for the stepped-up competition at Worlds and also raising money to help offset their travel costs, including hotels, gas and food for the four-day competition. For more info visi, roborattlers.org or their GoFundMe page at gofundme.com/roborattlers. The Robo-Rattlers team pictured (r-l) back row: Scott McCalla (coach), Drew Frankenberg, Emelia McCalla, Alec Harding, Maxwell McCalla, Karen McCalla (coach). Front row: Kyle Frankenberg, Finnian Smathers, Jonas Harding, Callum Smathers, Samantha Merrill.